When the Constitution was originally drafted, the Founders thought it appropriate to give the president the power to make treaties with other nations. However, the president’s power was restricted; under Article 2, Section 2 of the U.S. Constitution, the president could only make a treaty by and with the advice and consent of the Senate. Additionally, a never easy two-thirds senate approval was required. Without the approval, the President did not have the authority to enter into a treaty with any other sovereign nation. The treaty process is the same today. Yet, there seems to be another means of obtaining similar results: an executive agreement. The Constitution does not provide any process in which an executive agreement must be conducted. Rather, the practice of conducting executive agreements has been validated (to what extent is unclear) through rulings of the Supreme Court and the practice of the political branches. The question I am asking is: how broad is the president’s power to use executive agreements, and what are the future implications of that power? The President signing the Russian Arms Treaty at a ceremony in 2010. Treaties and executive agreements are drafted and signed many times each year. Originally, treaties were much more common than executive agreements; however, that is not the case today. After WWII, the executive agreements were used much more frequently than treaties. Many believed this was because of the increasing difficulty to get a two-thirds senate approval. The president has the ability to enter into sole executive agreements without any approval from the House or Senate. The shift from treaties to executive agreements has arguably eliminated the checks and balances the founders, when drafting the treaty clause, intended to put upon the executive branch. The countering argument is that the founders intended to give the president a broader grant of power when they added the vesting clause to the Constitution. 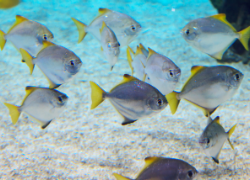 Executive agreements appear to have the same effect as treaties. They are binding upon both parties, and the Supreme Court has found them to preempt state law. This leads to the question of how broad is the president’s powers in entering into executive agreements? There seems to be some constraint upon which issues the president can execute sole executive agreements. The limitation appears to limit the subject matter to issues in which the president already has the power to direct, namely foreign affairs. The president cannot use a sole executive agreement to usurp congressional powers; however, the court has not dealt with this question directly. What this all means is still unclear. But one thing that is certain is there will be uncertainty moving forward. Over the past few years, we have seen the issue come up time and time again. In 2009, President Obama declared he would temporarily bypass Senate ratification if a Russian Arms treaty was not ratified (it eventually was ratified in 2010), showing that he believed he had the power to bypass the requirements of the treaty clause. Specifically, he believed he could use an executive agreement when dealing with Arms relations internationally, something that had only previously been done through treaties. President Obama’s belief that he has great autonomy in using executive agreements was shown recently in his speech at the White House addressing the conflict in Syria. President Obama stated, “Yet, while I believe I have the authority to carry out this military action without specific congressional authorization, I know the country will be stronger if we take this course, and our actions will be even more effective.” Though it appears the President believes he has complete autonomy in using executive agreements, other factors are considered when making the decision of whether or not to include other branches of the government for approval. Other controversial uses of this power have been the Anti-Counterfeiting Trade Agreement signed in 2011, which potentially would authorize foreign companies to effectively remove web content in the United States without legal oversight. Additionally, the Afghanistan Bilateral Security Agreement could potentially put troops overseas for another 10 years without a two-thirds senate approval. In the end, giving the president this power appears to be what the legislative and judicial branches are wanting, or at very least accepting. There doesn’t seem to be much fight regarding where the president is deriving the power to enter into such agreements. It appears the only source of power is derived from past practices and the vesting clause in the Constitution, but to what limits? Which begs the questions, why isn’t there more of a fight from the legislative branch to restrict the president’s power? How far will the power be allowed to go, and at what point will the president’s power be constrained? Only time will tell the role of the treaty clause moving forward. Will it be set aside while executive agreements take control? Or will there continue to be a middle ground where both have a place in foreign affair relations? This week, the countries of Sudan and South Sudan signed their first accord since South Sudan gained independence in July. The two sides, in a deal mediated by officials from the African Union, agreed to open ten border crossings between the two countries. They will consult with the joint technical committee responsible for border demarcation before meeting again next month to determine the final locations of the crossings. Six soldiers from each country and six neutral soldiers from Ethiopia will guard the border crossings. Despite the agreement, the demarcation and the security of the border between the two countries remains a major issue. Three separate conflicts have occurred in the border region in the last few months. Fighting persists in the Sudanese border states of South Kordofan and Blue Nile between the Sudanese army and ex-rebels with ties to South Sudan. Three hundred UN-sanctioned Ethiopian troops remain at the border to monitor a demilitarized zone that is six miles wide on both sides of the border. The relationship between the two countries remains tense, as both sides have declared the other has violated the separation agreement. 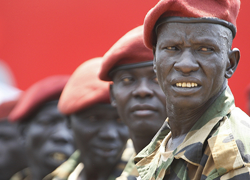 Sudan accused South Sudan of supporting rebels fighting in border states, which South Sudan denies. However, Sudan appears to be retreating from that position after Defense Minister Hussein stated, “there are no allegations against the government of South Sudan and there are no differences between us on Blue Nile and South Kordofan.” On the other hand, South Sudan has recently accused Sudan of attempting to damage its economy with a cargo embargo, causing runaway inflation within the newly formed country. Sudan proffers that it implemented the embargo to protect its own economy before South Sudan’s independence. Although the agreement to open the border shows the two countries are willing to work together, there is still a long way to go before the conflict between the two countries is settled. The border remains disputed, without demarcation, a process that will inevitably increase tensions, as both sides assert claim jurisdiction over Abyei. The two sides have also failed to form an agreement on oil. However, any agreement and cooperation between the two countries represents a positive step towards settling the conflict and achieving peace in the region. To understand anything about the contemporary Chinese perspective on international law, one must have a cursory understanding of China’s history of international relations. In this regard, Chinese history can be divided into three distinct periods: 1842 to 1949, 1949 to 1978, and 1978 to the present. The first period begins on August 29, 1842 with the coerced signing of the Treaty of Nanjing and ends on October 1, 1949 with the creation of the People’s Republic of China. Professor Wang described this period as “the unequal treaty regime” because it was characterized by China signing treaties with imperial powers while under duress; treaties which were highly detrimental to China’s own interests. The most egregious example from this period came in the form of the infamous Twenty-one Demands made by Japan upon China. In 1915, the Qing Dynasty had just been overthrown in the Xinhai Revolution, leaving China in a politically vulnerable state of transition. At the same time, Japan had recently emerged as an imperialist power after its victories in the First Sino-Japanese War and the Russo-Japanese War. With an eye towards “gobbling up the whole of China, ” Japan occupied the Chinese province of Shangdong and presented the Twenty-one Demands to the President of the New Republic of China, along with an ultimatum that the Chinese president accede to the demands or Japan would retaliate with the use of force. 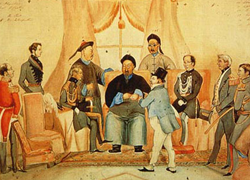 Accordingly, President Yuan Shikai signed this treaty of “national betrayal and humiliation ” which, inter alia: recognized Japan’s predominant position in Shangdong, Manchuria, and Inner Mongolia, provided for the joint Japanese-Chinese operation of China’s iron and steel industries, and mandated control by Japan of China’s political, financial, and police administrations through the imposition of Japanese officials within Chinese administrative structures. The second pertinent period began on October 1, 1949 with the founding of the PRC and ended in 1978 when China began its process of “opening up.” During this period, China was actively precluded from participation in the development of international law. Western powers simply did not regard the People’s Republic of China as a legitimate state, such that it could be a part of the international community. As a result, the most populous country in the world was not admitted to the United Nations until October 25, 1971. During this second period, China developed its own identity relative to the world and began the process of institutionalizing international law in society. Because of its unique situation, China established what could be described as a dual identity during the Cold War period. On the one hand, China found an obvious ally in the Eastern Bloc due to a shared political and economic ideology. On the other hand, China identified with developing countries due to their shared history and troubles. With this identity in mind, China began inviting legal scholars to China to develop a system of diplomacy in accordance with international legal principles. China sought to conduct its international affairs using the principles of equality, mutual benefit, and mutual respect for territorial integrity and sovereignty. Only during the final period, starting in 1978 when China opened up economically and continuing to the present, did it become a full member of the international community. Since then, it has become party to over 300 multilateral conventions and is now active in the creation of international law in all fields. In 2009, the Chinese Society of International Law conducted a study which found that over 600 universities offer courses in international law, 64 universities offer masters programs, and 16 universities offer doctoral programs. The importance placed on international law in the modern Chinese educational system shows that China takes the development of international law seriously and sees itself as an important player in the process. In short, China has gone from being a victim of international law to an outside observer of international law and is now an active participant in international law. Contrasting this history with that of the Western powers, who have been active and equal participants in the development of international law since its inception, makes it easy to understand why a pronounced difference in perspectives persists. While an appreciation for Chinese history is essential in understanding China’s position on all areas of international law, it is particularly relevant to the nation’s position on the concept of sovereignty. The next installment of this series will focus on the importance China places on state sovereignty.